In the last issue of 1775, we promised that we’d try to keep the magazine coming to you on a regular basis. We’re working hard toward making that happen. Phil and Alisha are still doing the layout and editing, respectively. That’s a lot of volunteer work for two people, especially since those two already have full time jobs. So it is with open arms that we recently welcomed Steven Rauchbach to our corner of the magazine business. To keep your magazines coming to you regularly, we need your help. We need articles. 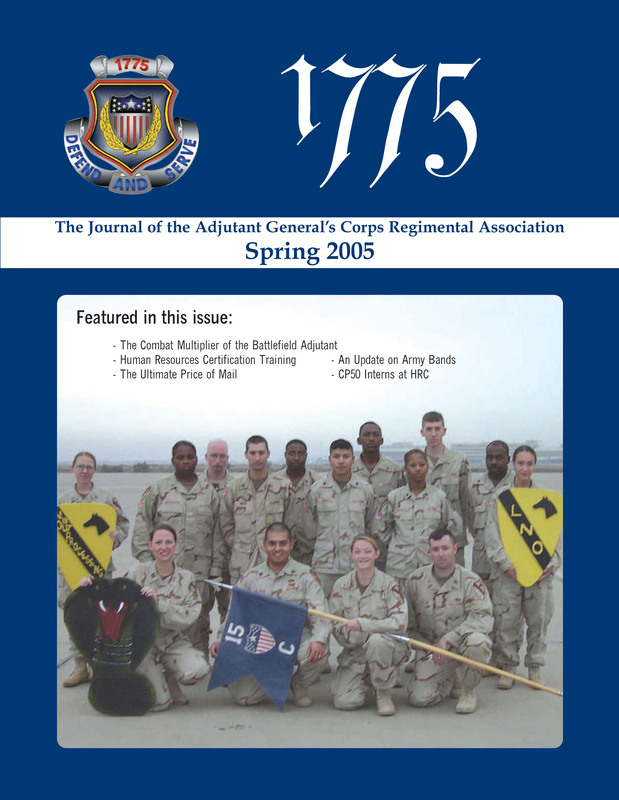 As you’ll read on page 1, the magazine is devoted to the advancement and professionalism of the members of the Adjutant General’s Corps Regiment. During this tumultuous time, articles to support that aim might include lessons learned from recently deployments. Let us know how you’re changing the way the AG Corps does business. Let us know how AG Soldiers and civilians are supporting the big Army and the war on terror. Share with others what your chapters are doing. Tell us about you’re AG Ball this summer. Toot your horn! Please spread the word. Send us, and encourage others to send us, the type of articles you’d like to read. You don’t have to be a great writer – we’ll try to make you look like one. We’ll clean the text up for you. Phil can do the same for any photographs you have. “Published author” is a great bullet on an evaluation report. And your picture could make the cover. We accept articles at any time. Contact us at magazine@agregiment.com. Guidelines for writing your article can be found at www.agregiment.com. Click on Writer’s Guide under Magazine at the top right. In conversations about the AGCRA, a common lament is, “I never get the magazine.” To ensure you continue to receive your magazine, you need to do two things. First, ensure your membership is current. Second, ensure your address is correct. The magazine is sent bulk mail. That means it is not forwarded if your address is not current in the AGCRA membership database. You can both check or renew your membership and change your address at our website, provided below. We look forward to hearing from you. The AGCRA can be a success only if you help make it a success.